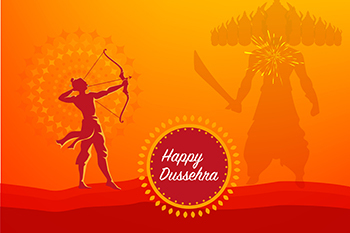 Dussehra or Vijaya Dashami is one of the most popular and widely celebrated festivals in India embodying the victory of Ram over Ravana in the battle of Lanka. In some parts of India, this festival is also celebrated as Durgotsava depicting the victory of Goddess Durga over the demon, Mahishasura. Either ways, the 10-day festivities essentially embody the victory of good over evil. Be it the might of Ravana or the arrogance of Mahishasura, it was evil that had to be destroyed and God almighty had to incarnate to destroy it. For an investor, the festival of Dussehra is to look at the evil within. It could have a variety of interpretations. It could be the loopholes in your strategy, the wrongs in your portfolio, or an incorrect approach to investing per se. Let us look at six key investment ideas that investors can take from the essence of Dussehra celebrations. If you take the Ramayana as a test case, there are lessons for investors from the approach of Lord Rama and even from Ravana. One of the finest lessons that an investor can learn from the fall of Ravana is to avoid the dangers of arrogance and an inflated ego. Ravana was one of most learned men on earth, and he had mastery over 64 art forms which included music, administration, sciences, economics, astrology, and warfare as well as the language of birds and animals. Extreme arrogance was his eventual undoing. His self-esteem almost bordered on arrogance. An investor should be humble, first and foremost. The market gives out a lot of insights and lessons, and an arrogant investor tends to close his mind assuming he/she knows it all. An open mind, on the other hand, can help the investor make the most of market events, news, and expert opinions/discussions. This is a lesson that every investor must learn from Rama. Even in the midst of his “Vanvaas,” Rama never forgot his basic Dharma. When Sita was kidnapped, he rallied an army of monkeys and bears, which gave ample evidence of his resourcefulness. For an investor, the lesson is all about being passionate, determined, and focused. Once you have a goal and a target return, you must stand by your investment strategy and be determined not to back out due to panic. When Hanuman reached the court of Ravana, the response of the latter was that of disdain. Ravana believed that an army of monkeys and bears had no chance against the Kingdom of Lanka, which had the most formidable armies in the world at that time. It was this overconfidence that made Ravana let his guard down. As an investor, there will be good periods and there will be bad periods. You have to be careful not to let overconfidence creep during your good performance. Even with the best of strategies, probability and the law of large numbers can work against you. Always be wary of that and be willing to change your plan on-the-go if the need arises. No one is too small or too meek to defeat you. This was the lesson that Ravana learnt the hard way when Rama and Lakshmana supported by their army of monkeys and bears managed to destroy Lanka. When you are investor, be careful never to underestimate on two fronts. Firstly, don’t underestimate the ability of the market to surprise you. Markets have a nasty way of reminding you. Secondly, don’t forget that your peers, competitors and other investors are also constantly strategizing and that your moves aren’t the only factor that has an impact on your performance in the markets. For Rama to conquer Lanka and liberate Sita was never going to be easy. He knew that to win the war, he would have to patiently wait for the right opportunities to come by. His focus was on moving forward one step at a time. It was this mix of patience and strategy that worked in his favour. For an investor, patience is the byword. Equities do not generate quick returns, and you need to be prepared for the long haul. Above all, when you are convinced about a stock or an idea, it is essential to persevere with that idea for a long time to come. This is how multi-baggers and super normal returns are generated. The final message of Dussehra is that the right path (the path of Dharma) will always triumph. It may not be simple and it may not be straightforward, but you need to persist on that path. The same lesson holds true for investors too. Once you have decided on the right strategy, stick to it and persevere. You may find a lot of short-term options and temptations that may appear to be very seductive and profitable. As long as you are on the right path defined by your long-term strategy, you are bound to create wealth in the long run. Don’t be tempted by instant gratification in the market!